Awesome to see 16 RS Aeros out at the Massapoag YC Regatta, Sharon, Boston, USA on Saturday - a new record turnout east of the Rockies! Gareth Griffiths from the UK happened to be in Boston that week and seized the opportunity to join the fun! Other big travellers included John and Tom who form part of the new Sailfish Club fleet in Palm Beach, Florida! 'What a difference a year makes! 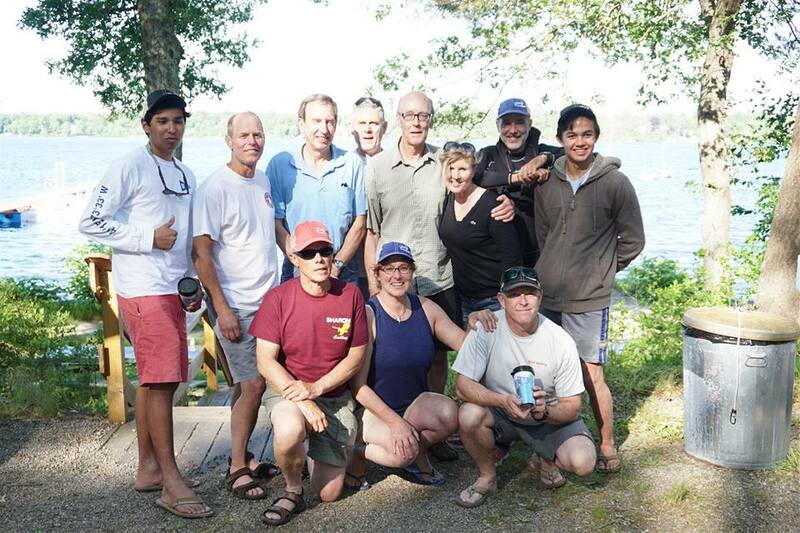 In 2015 this regatta was memorable as being the first regatta for RS Aeros ever held in North America east of the Rockies. There were three RS Aero sailors, Gary Werden, Eric Aker and myself, Derek Stow. We had only taken delivery of our RS Aeros a couple of weeks before. Eric won. This year sixteen RS Aero sailors showed up for the event. There were sailors from Massachusetts, Rhode Island, Connecticut, New York, Florida and the UK. Obviously the word had got out far and wide about the wonderful hospitality, superb race management, and perfect weather that one can always expect at the MYC Small Boat Regatta. And this year was no exception. Winning the RS Aero fleet this year was Gareth Griffiths from the UK. Regatta chair Diane Kampf explained at the skippers’ meeting how Gareth had flown in from England in his private jet especially to sail in our regatta. Unfortunately the truth was a little more mundane. Gareth was visiting the Boston area on business last week and realized he could take in some RS Aero racing if he stayed over another day. Gareth was very helpful to many of the sailors in passing on tips about how to rig and trim and sail the RS Aero and made a lot of new friends. We hope he will be able to come back and sail with us again one day. In third place was MYC’s own John Eckart. I understand that John owns a Flying Scot, a Laser, a Sunfish, a Moth (and maybe a few more I haven’t heard about) and that he is fast in all those classes. He certainly put on a very impressive performance in his first regatta in an RS Aero and, like Marc, was very ready to share his enthusiasm for the RS Aero with anyone within earshot. RS Aeros tend to have that effect on people! In this regatta, the RS Aeros with 7 and 9 rigs were sailing together as one fleet. The first three sailors were using the larger 9 rigs, but Bob Adam in a 7 rig stayed very close to the leaders all day and took fourth place overall. Bob is the VP of Sales for Zim Sailing our local dealer for RS Aeros. Although Bob’s job gives him many opportunities to sail all sorts of cool boats, he doesn’t often find the time to race small boats in a regatta. But he did sail the RS Aero at the Wickford Regatta and at this event. His enthusiasm for the RS Aero was obvious as he sailed screaming reaches back and forth between races like some teenager who had just discovered the joys of planing. By the way, if anyone wants to buy an RS Aero for the Newport Regatta in a couple of weeks, Bob tells me has plenty in stock at Zim Sailing in Warren, RI. Rounding out the top five, and winning one of the coveted mugs with pictures of Gary Werden and me on it was Eric Aker. Has anyone noticed Eric’s unique style of sailing in an RS Aero? He trims the mainsheet directly from the boom, upwind and downwind, in all wind strengths. What is that all about? Doesn’t he have a ratchet block? He tells me that this method puts less strain on his back, and I guess he should know because he is a retired doctor. He must have biceps of steel! This technique certainly works for Eric but I think I will stick to using my ratchet block. In seventh place was my son Chris Stow. I would like to be able to say I taught him everything he knows about sailing, but it wouldn’t be true. Chris majored in sailing and minored in engineering at some technical college on the Charles River, and was much in demand as a Star crew later in his sailing career. Chris is also clearly a future RS Aero owner. I think he is working on the theory that RS Sailing will sell off their eight boat charter fleet at some point and he will score a good deal from them. If that doesn’t work out I might just have to sell him my RS Aero and buy myself a new one. Actually I think I really need to buy two new RS Aeros. You can never own too many RS Aeros. In eighth place, and second 7 rig, was the very average Gary Werden. Gary was clearly shooting to win the prize for most mediocre sailor at the regatta, awarded at some regattas for the person who finishes in the middle of the fleet. In the first three races his plan was working perfectly as he scored 8,8,8. But then he went and blew it in the last two races. Somehow he couldn’t avoid scoring 7,5 even beating sailing coach extraordinaire Judith Krimski in her 9 rig in one race. Why Gary would want to win a mug with photos of me and him on it, I have no idea. 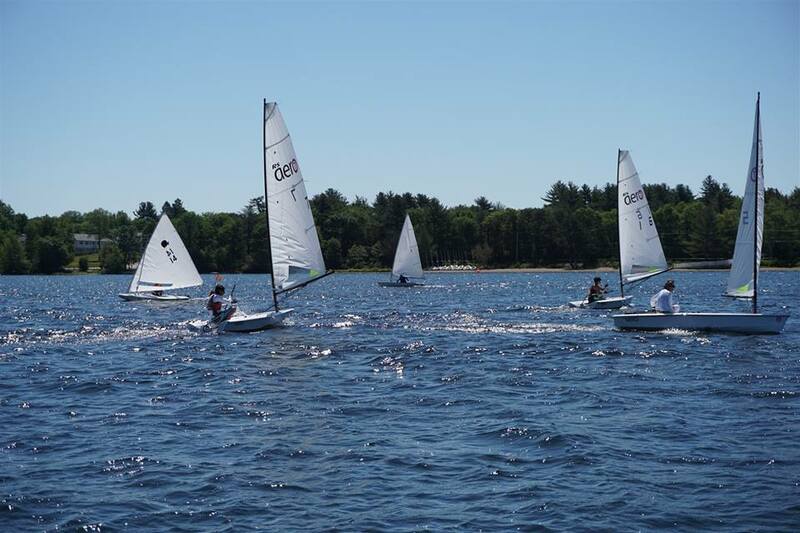 In ninth and thirteenth places were two junior sailors from Cedar Point YC, Grant Ballesteros and Max Haslett. Thanks to Marc Jacobi for persuading Grant and Max to come to our regatta and providing charter boats for them. It was very gratifying to see these two talented youngsters stepping into the RS Aero and sailing so well. Makes a welcome change for me from sailing around with grumpy old geezers like myself all the time. In tenth and fourteenth places were David and Melissa Solnick, a delightful couple who live in downtown Manhattan, a place not normally known as a hotbed of dinghy racing. David owns an RS100 and Melissa has an RS Aero and they sail out of Sebago Canoe Club on Jamaica Bay. David and Melissa are planning to sail in the RS Aero European Championships at Travemunde in July and thought that racing at Massapoag YC would be perfect preparation for sailing on the Baltic Sea. In twelfth and sixteenth places were John Brim and Tom Bowler. John and Tom are both members of the seven strong RS Aero fleet at the Sailfish Club of Florida in Palm Beach. SEVEN!! They must hold the current record for largest RS Aero fleet in North America east of the Rockies. The Boston RS Aero fleet (which is how the three of us who sail at MYC rather presumptuously style ourselves) has some catching up to do. It was a pleasure to meet John and Tom for the first time. John tells me that his fleet is thinking of hosting an RS Aero Midwinters Championship in Palm Beach. That would be awesome. I have wonderful memories of sailing a Laser regatta in that area which was held out on the open ocean off Palm Beach. Amazing waves! In fifteenth place was Ian Drake from Cape Cod. 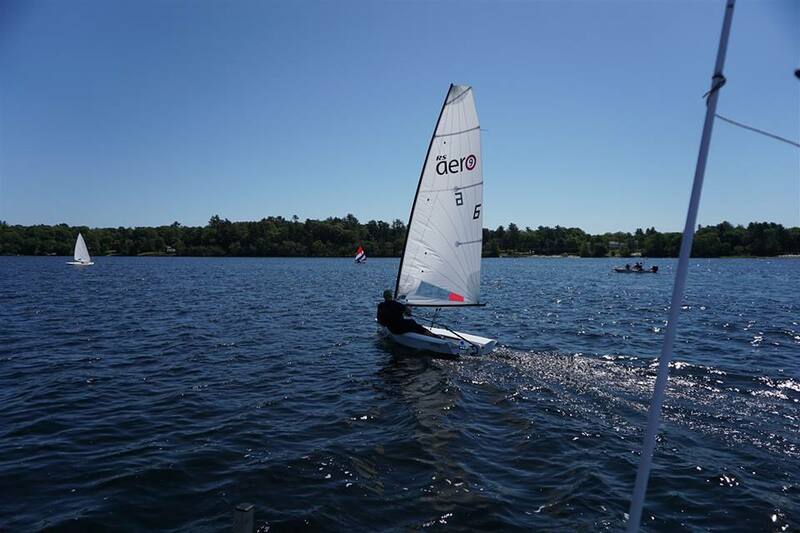 Ian came to our regatta at MYC in September where the wind left a little to be desired. Well actually the wind went away altogether for most of the time. I guess the club must have been doing something right though, because Ian came back for more and we managed to arrange some superb sailing weather for him on Saturday - warm and sunny and a breeze of about 10mph from the NE. You are always supposed to make up some facts about the wind in a regatta report. I almost forgot. And last and by all means least, in eleventh place was your scribe Derek Stow. 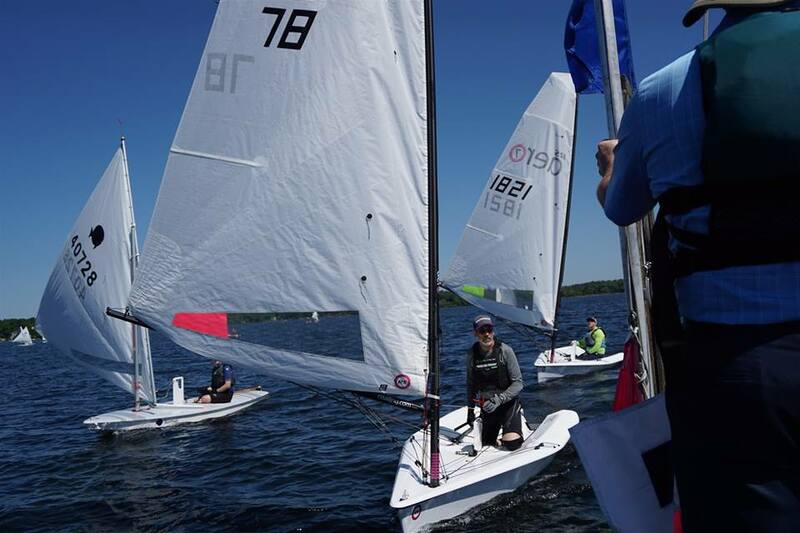 Not exactly my best regatta performance ever, but as I said to Gary before we launched, as we looked in wonder at the sight of SIXTEEN RS Aeros at our little lake sailing club, “I feel like I’ve already won.” Thank you to all the sailors who came to the regatta. You made this grumpy old geezer very happy. Please come back next year and bring a friend. 'The day dawned bright and warm with a gentle NE breeze as the fleet started to assemble. In some cases literally assemble as there were eight charter boats to rig including one brand new hull to rig from scratch. Many hands make light work they say, and Aero's are certainly light. Everyone pitched in helping the new Aero sailors figure out the rigging - fortunately the boats are very simple to rig. Soon the whole fleet was on the water with a mix of rigs all to start together. The wind was just enough to fully hike in the 9's but never be overpowered - perfect introduction for new Aero sailors. Race 1 saw Gareth Griffiths a visiting UK Aero sailor make a clean starboard end start to lead round the top mark of the windward leeward course, a lead he never relinquished despite a concerted attack on the last run from Marc Jacobi and John Eckart with these three finishing in very close order setting the scene for a day in which this trio filled the podium in various orders in every race. Race two started in similar conditions but this time it was Marc who got a flyer and won by a country mile from John with Gareth creeping through to third after a poor first beat. The wind near the top mark was proving hard to read with many twists and turns. Race three saw the closest finish with Gareth just getting his bow ahead of Marc on the run to the finish with John Eckart again third. Back ashore for a great buffet spread in the clubhouse with all to play for. While the podium places looked likely the order could go any way as wind picked up a bit and the Aeros started to fly. Race Officer decided to create some variation with a Box course for the next two races. That should be a beat, reach, run, beat back up to the previous mark, run back down again, reach and short beat through the line. However this concept seemed sufficient to confuse the leaders who were having far too much fun covering each other. In race 4 Gareth again got away and started the second beat with a clear lead but he overstood the windward mark briefly forgetting which top mark to round while Marc found a great last shift to steal the lead. Still all to play for with Marc and Gareth tied at this point. A final race shoot-out loomed. Race 5 - same box course - Marc got the best of the first leg followed surprise, surprise, by John and Gareth. This time Marc led the fleet astray briefly thinking he was finishing after one lap. However up the beat John and Gareth got a good lift and slipped past. The wind was now definitely showing its fickle side waning slightly and blowing across the lake with gusts on the run coming from all sides (but rarely from behind). Gybing the shifts Gareth was able to stay ahead of Marc who followed his course with both passing John who took a more straight line course. Final reach and short beat with a few covering tacks and Gareth claimed the spoils. Awesome movies of the 16 RS Aeros at the Massapoag Regatta. Looks like great sailing and racing! Thanks to Derek Stow for posting online. Credit to; Gary Werden, Anne Pennington, Bob Gaffney and Colin Snow.